Nanashi, at the start of the game. You play as Nanashi, an agoraphobic middle schooler who spends every day sleeping and playing video games. Nanashi left his hometown after experiencing intense bullying to move in with his cousin, Mikado, who made the latest Master Program. The Master Program surveils each citizens’ unique ideas and Bitphones. One day, a mysterious girl named Misane shows up and says, “Let’s make some friends.” Soon after Nanashi agrees to her suggestion, strange things begin happening in town. The two discover that someone is hacking the Master Program and interfering with citizens’ Bitphones, causing them to be controlled by someone else from afar and lose their memories. Your goal is to solve the mystery behind who is hacking the Master Program while making friends. As you progress through the game’s four main chapters, meeting fellow citizens and helping them out with quests, the story becomes more complex and mysterious. The game is split between detective and conversation mode. In detective mode, you explore town and gather clues by talking to the locals in order to progress the story. In conversation mode, you have to piece together the clues. But if you don’t ask the right questions at the right time you’ll take HP damage. If your HP reaches 0, you lose. 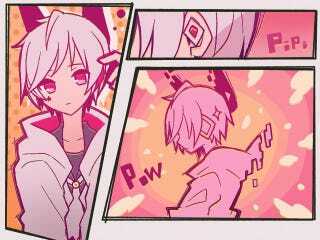 Nanashi discovers a new conversation topic to bring up with another character in the game. While this sounds simple enough, it’s surprisingly difficult. I kept bringing up the wrong topics at the wrong times. You have a high HP, so there’s room for mistakes, and the game also gives you some clues as to what you’re supposed to do. But by the third chapter of the game you get considerably fewer clues, and you really have to think wisely about how you’re going to interrogate a subject. Often, I got confused as to what I had asked before, or whether or not a topic was relevant to bring up. In your spare time between chapters, you can explore the town and focus on cultivating friendships with the residents. This basically just boils down to buying them a ton of presents based on their interests. For example, the mad scientist who lives next door loves muscle powder and weird-tasting snacks. If you buy a person enough gifts, they’ll talk to you and ask you for help with certain things. There’s a bookworm who needs help with marriage interviews, a shrine caretaker who is being swindled, and a little girl learning to overcome her nervousness. To earn money to buy said gifts, you can play minigames like Tetris and Puyo Puyo. You spend a lot of time grinding, but the number of friends you make can impact the ending you get. Nanashi thinks of himself as a worthless human being and puts others on a pedestal. Making friends helps Nanashi to realize his self-worth and that he deserves to be loved. Nanashi and Misane are in CocoAlley, one of the areas in the game. Themes about love, friendship, and self-esteem are central to the game, and they’re thoughtfully portrayed. There’s a lot to love about this game. Each character is quirky and endearing in their own way. 1bitHeart is adorable, with peppy music and cute art. You can get 1bitHeart on Steam.